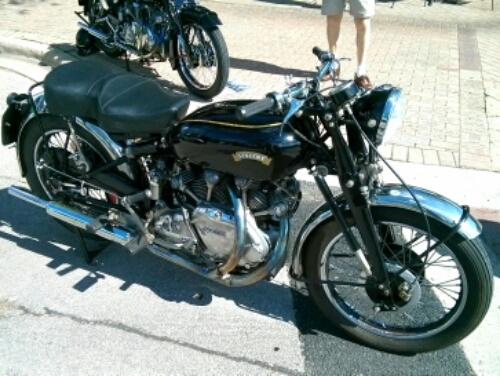 Some other cracking motos attended the show: starting with this immaculate ’68 Bonneville. 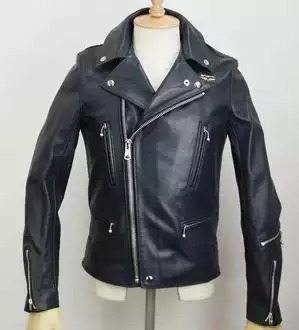 Surgically clean to a mirror finish with astounding original detail. Even down to the cork seal under the fork gaiter. 100% concourse. 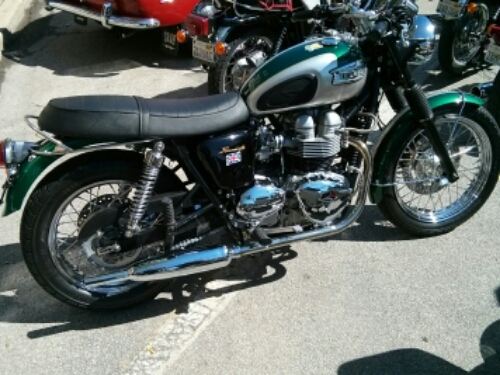 Even a new T100 Bonneville stood proud. 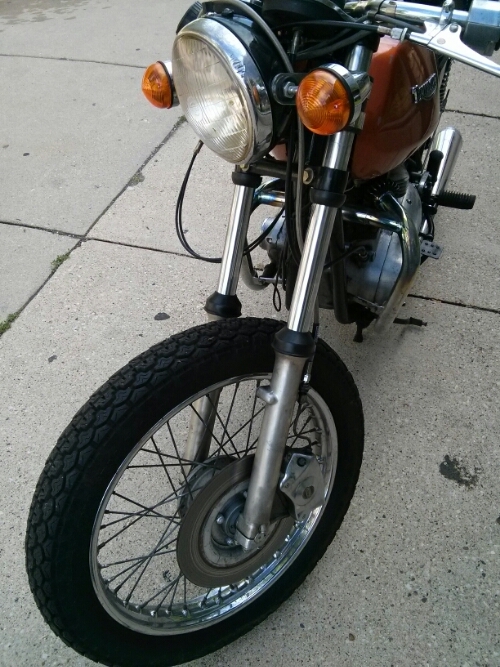 Nice straight muffler to match the original – the standard kinked on replaced here. 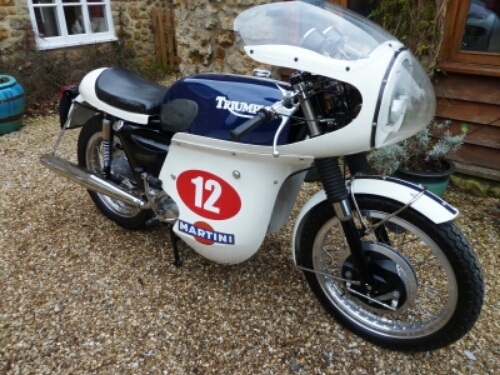 An adequate stablemate for a sixties T120. 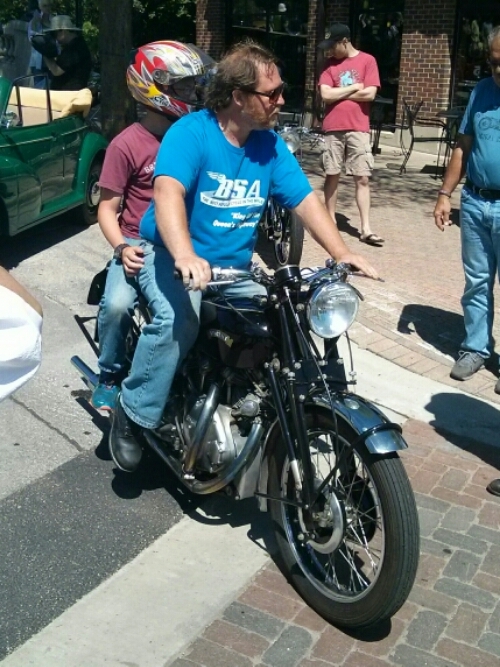 Somebody had brought a road converted Triumph race bike. Somewhat cobbled but obviously gave its owner the thrill of speed. 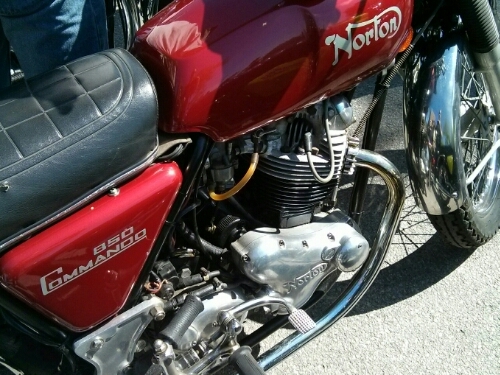 Somewhat of a Mad Max style ..
Norton Commando in rosy cheek’d color. 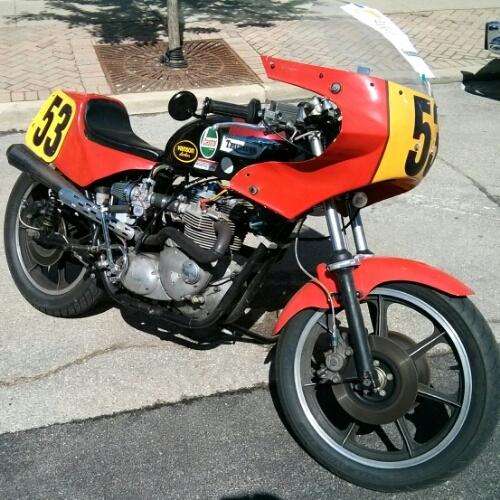 Great seventies superbike! 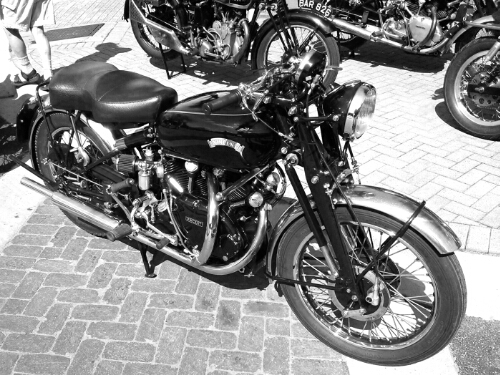 A BSA B31 single sat sunning itself in the late June sun. Same colors as the Rocket Gold star I had. This thumper is a neat scooter. 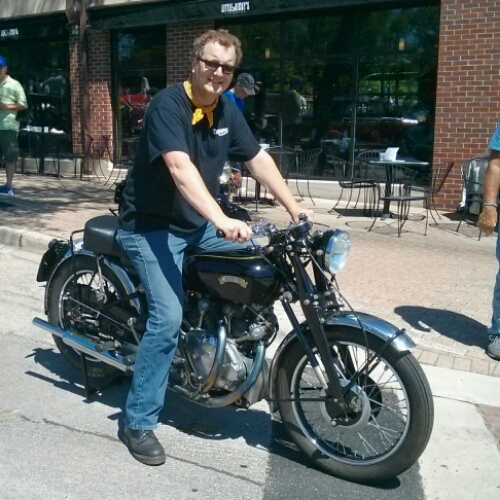 A classic car and motorcycle show on a couple of closed off streets in Winnetka was attended today. All European stuff. And NICE stuff too! Today I’ll concentrate if the Crown Jewels of the show: a splendid display of no less than 11 Vincents. Quite overwhelming and each individual. 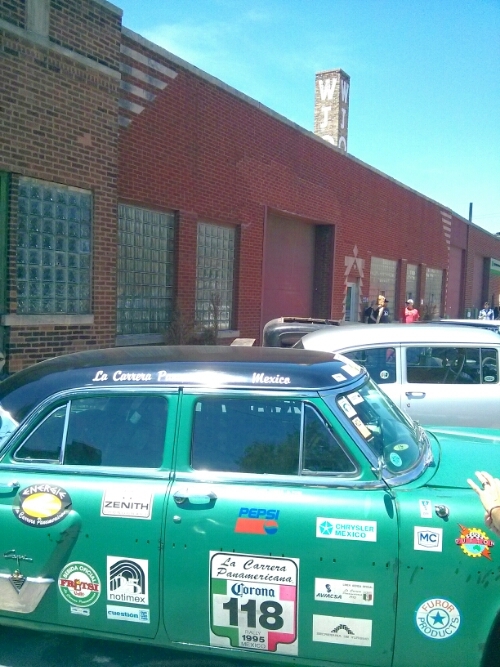 The first is a ’52 Black Lightning – just like Richard Thompsons song of the same name. Just in need of a Red Molly to take it for a ride. 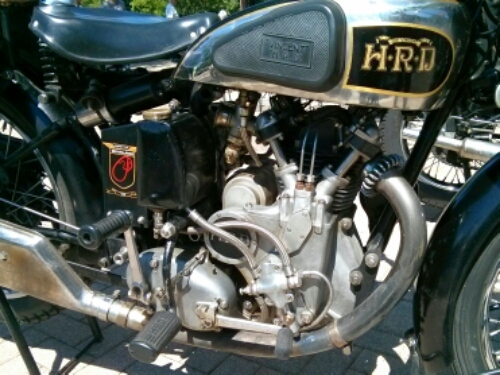 This single cylinder HRD Meteor still looks the part next to its doubled-up brethren. 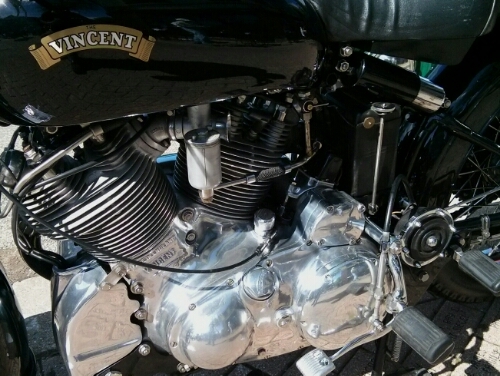 The first true Vincent engine where Phil Irvine worked out many of the motor mechanicals to be seen in Vincents nearly twenty years. This hyper clean example was a rebuilt barn find. You could stare at your the polished surfaces all day. The color is perfect: black, metal grey and a hint of gold. The monochrome of a bygone age. 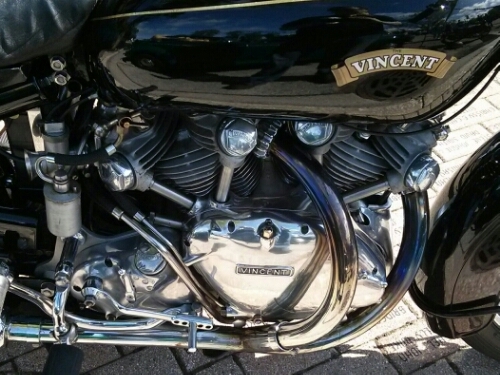 I asked Ed if I could sit on his Vincent, he very kindly allowed me to. A little upright for me. But comfy and everything placed well. Next goal: to take one for a fast spin! My front fender (mudguard) stays snapped today on the ride. The typical vibrating Triumph and bumpy roads put paid to the poor 70’s design ( which was redesigned later with more sturdy connections). So now the front is fenderless. 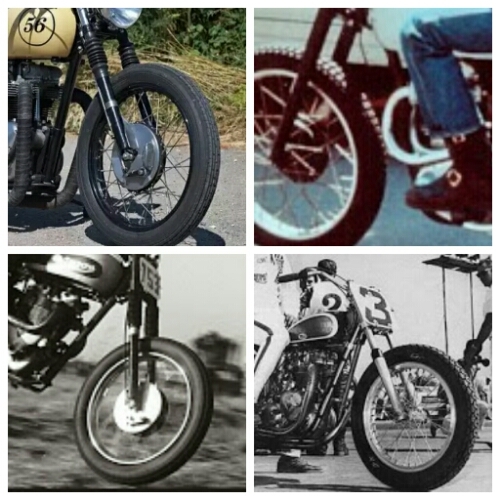 Not too bad a company… Bobbers, The Fonz, Evel Knievel. 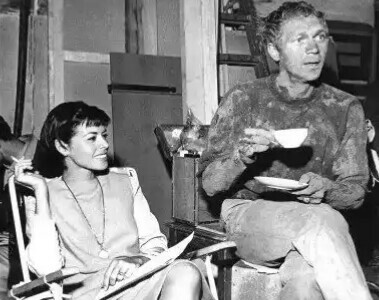 Bill, you’re gonna like this one! 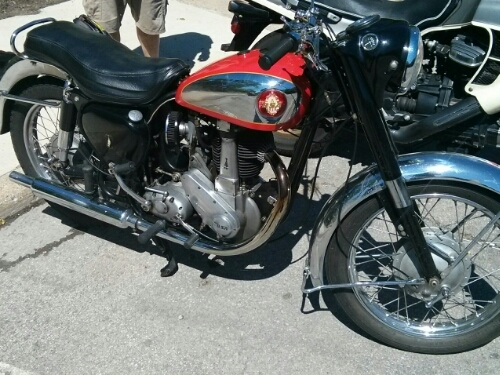 A true zenith in Meriden Triumph motorcycles. 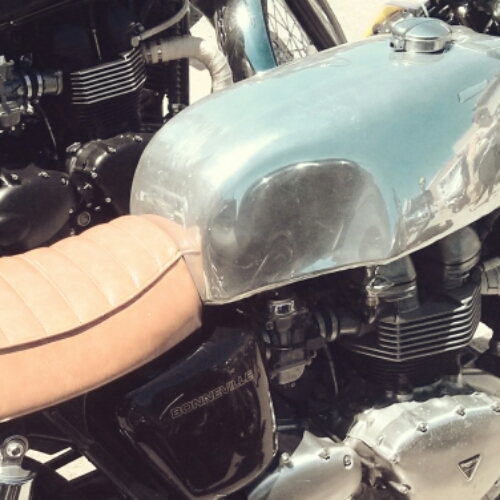 The Thruxton! 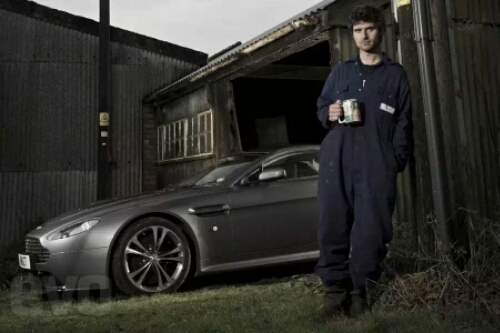 And this here one is a special looking beast: all details present and correct from the alloy hoops, to the long Dunstall pipes (which as noted by Mr Ferry, have a high route over the timing side and gearbox) and the beefy and thirsty tank. 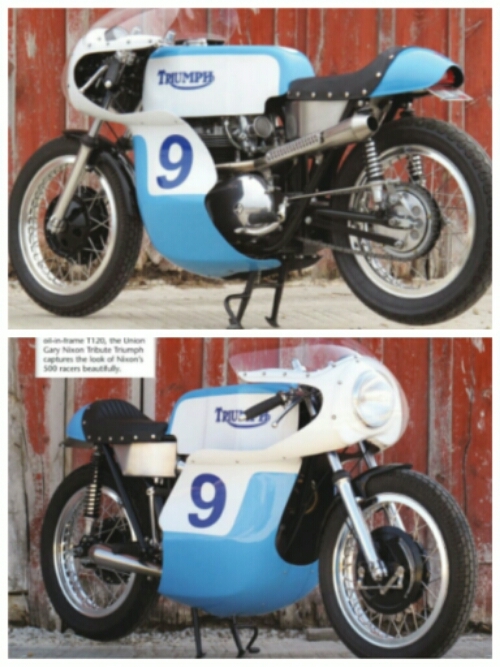 Gulping twin Amals, night blue color and that Diana Dors shaped fairing. The five speed gearbox give a hearty top speed I’m sure. 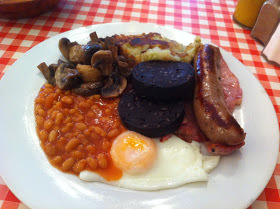 Tuck in you’re in for a treat! Pilots eye view let’s you slip through the air with ease. No wobbling goggles here. 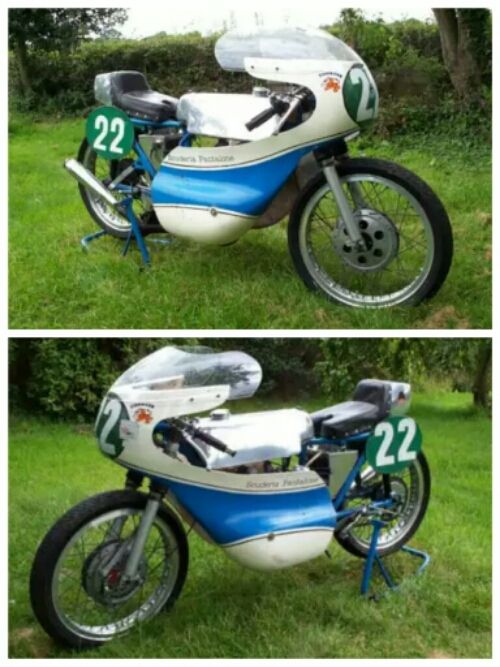 Look up racing motorcycle in any Boys Own annual from my youth in the seventies and this is what you’d see. Classic! The nose cone looks like something from NASA. 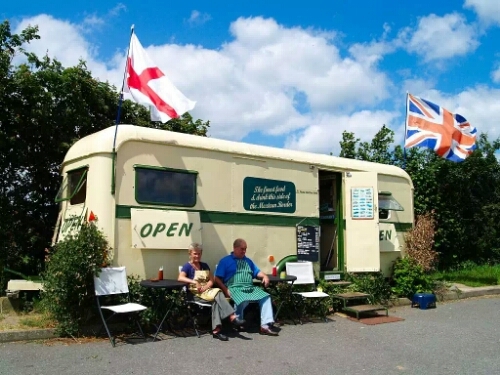 Oh yes, and yours for £9,650 from Venture Classics run by Chris Spaett based in Somerset UK. 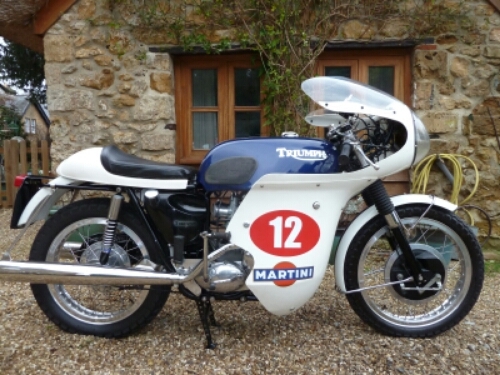 http://www.ventureclassics.com/stock%20list.htm go and have a gander at their other offering; plenty of fine machines to gaze at. 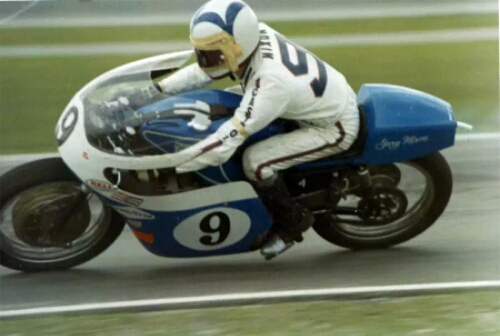 Let’s keep on this Gary Nixon vein…. 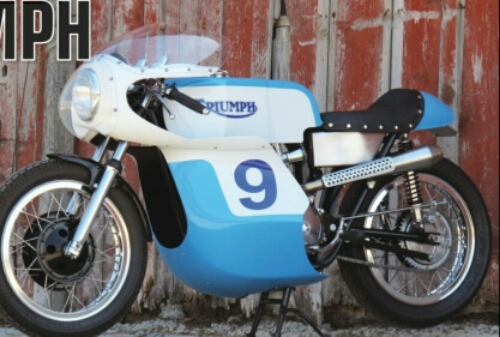 A modern day Triumph Daytona in the blue and white color scheme and also numbered nine. It can lean like a the best of ’em. Under the control of talent of course! The 675 race bike is a genuine piece of speedy machinery. Needing a big space and fast corners to wring the best out of it! Post title comes from Badfingers hit Baby Blue used to outstanding effect in the closing scene of the series Breaking Bad. 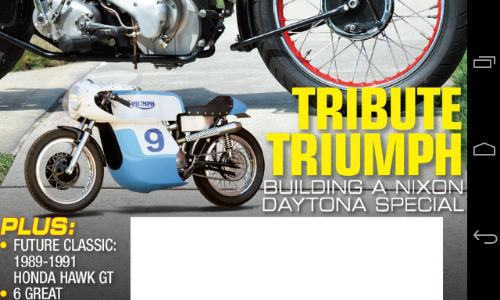 My latest edition of Motorcycle Classics arrived earlier today and what should be on the cover but a Gary Nixon tribute Triumph. 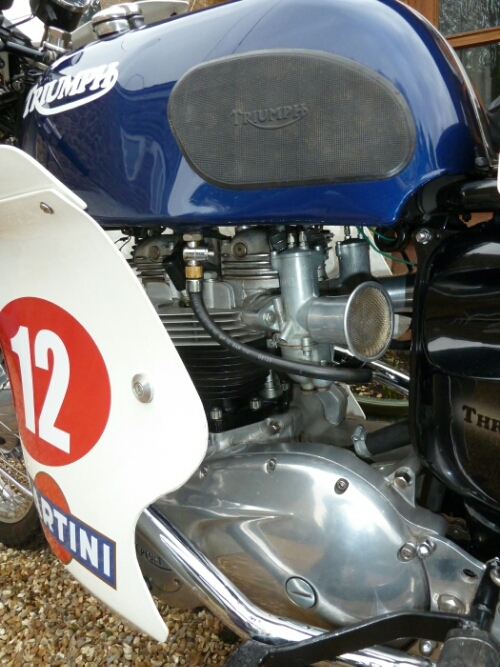 Not only that but a seventies Oil-in-Frame T120R set up ad such. Number 9: baby blue. Lookin’ cool as ice. 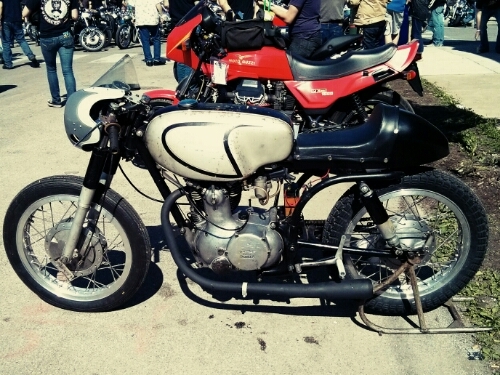 It is a build from Union motorcycle workshop in Nampa Idaho http://www.unionmotorcycle.com/index.html . 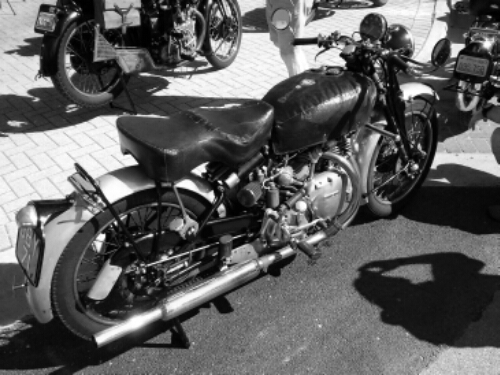 great article about a basket case brought in by a customer wanting a bobber – a little discussion and this roadworthy repli-racer was developed. Me? I’m sold! Every inch is perfect. 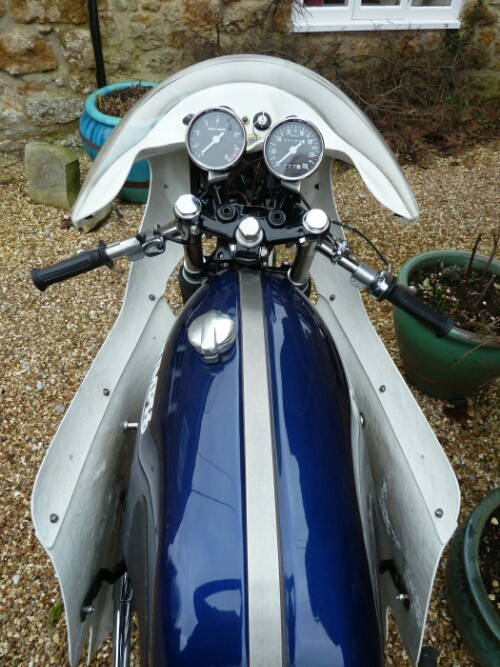 The lines, the big race tank, curvy fairing, alloy rim’d wheels, short seat, one up one down exhaust. It sets you up for, what I believe to be, the perfect riding posture. 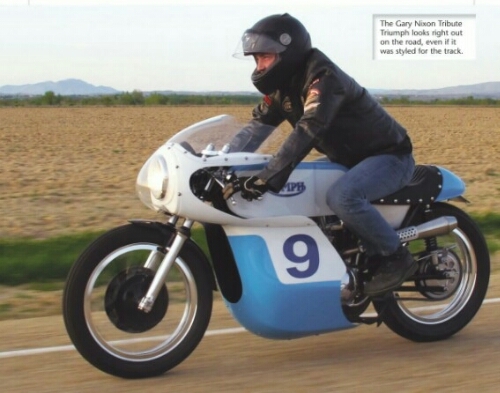 When you talk about the history of racing Triumphs; one legend comes to mind: Gary Nixon. His superlative skill on road, track and trail. 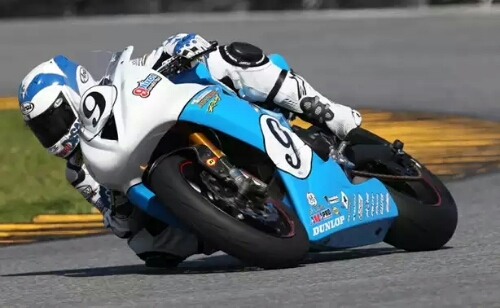 His Number 9 adoring the white and blue bodywork saw numerous victories for this dogged and respected racer. A pint sized repli-racer: a well fettled Cub resplendent in Nixon ‘Blues’. Small in stature but big of heart. It looks like an outstanding wee tool. A Cub adapted for speed work: looks like the Salt Flats with big pipe, low bars, skinny tires and lightweight clothing(!) 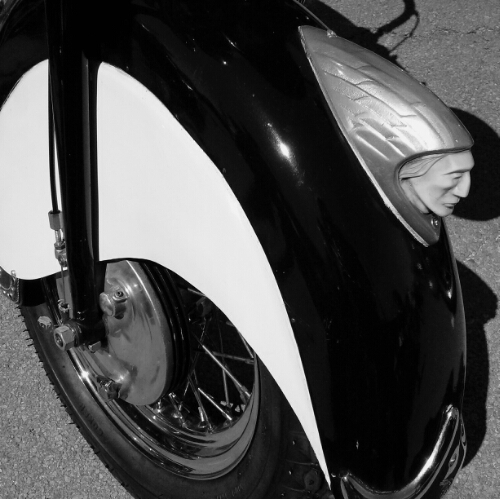 Though not as streamlined as Rollie Free on his Vincent. 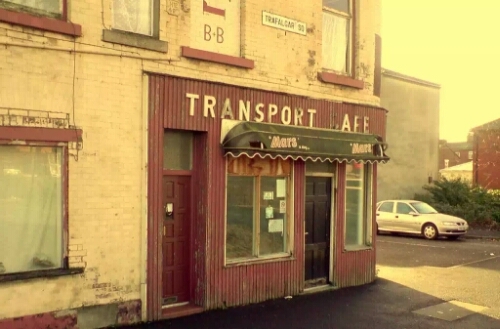 Would definitely like an old truck to tote my ‘cycle about in. 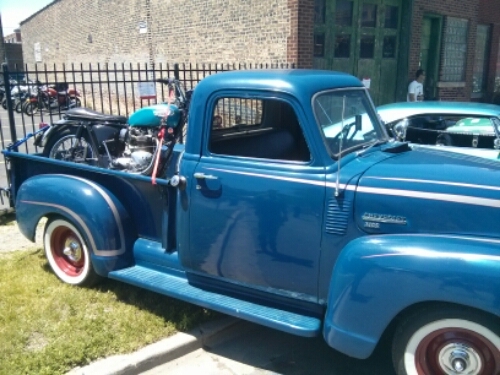 This Chevy is a perfect one… The fifties half ton truck. Nice blue Bonnie in the bed too. 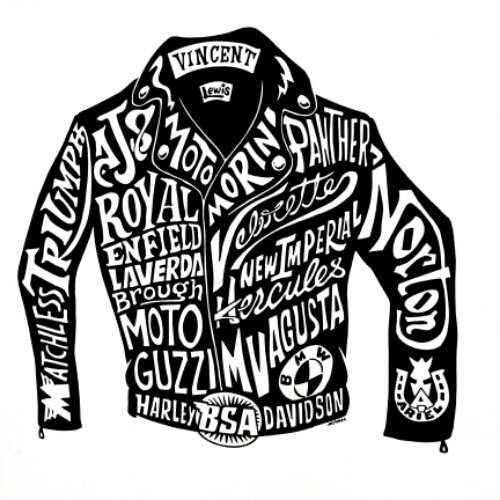 A screen print poster sold at Motoblot: the creases of a Lewis Leathers jacket hold the classic bike names from the golden age of motorcycling. Lewis are the riders protection of choice that improve with age and mileage: especially in the temperate damp airs of Britain. 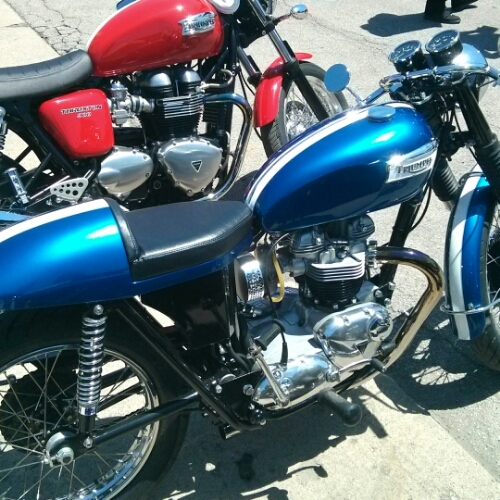 A new Thruxton in racing red sits aside a blazing blue sixties repli-Thruxton. Eeny meeny miney mo! 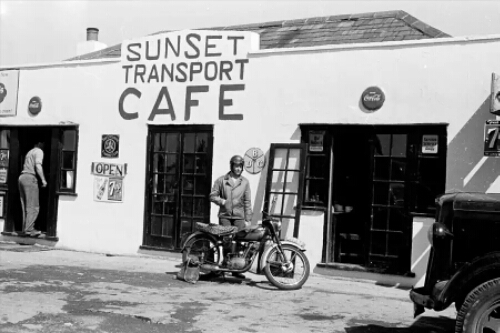 The best V-Twin Harley Davidson made: from the thirties… The Knucklehead just looks the business for the original Route 66. 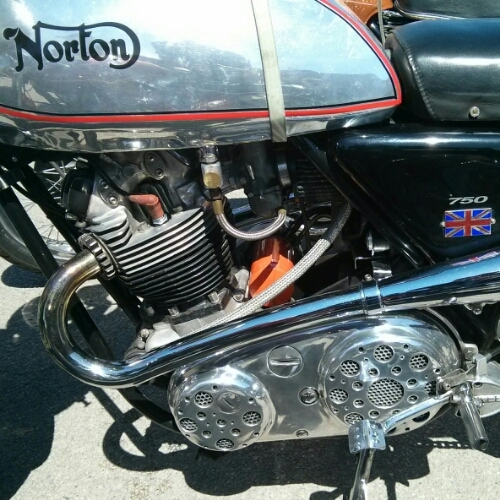 A motorcyclists Norton indeed: big tank, short pipes, rear sets and a belt primary drive. This one hailed from Ontario Canada. I like it! The Motoblot was also Autoblot for a select few rare classics that fit in with the predominantly sixties charm of the days collective. Starting with a juicy emerald green monster. 1954 Ford Lincoln Capri – stands daubed in classic rally ‘finery’; this particular one has torn along the dusty roads of Central America with helmeted pilot and navigator at the helm. 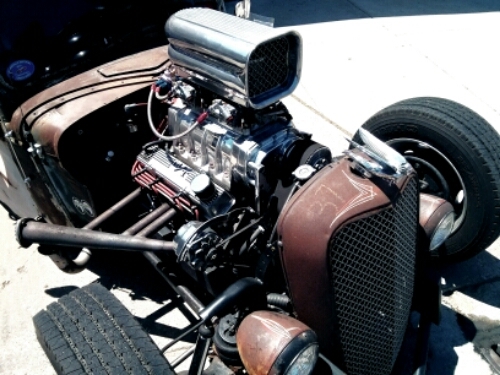 Ford Coupé rat rod: oversized and overpowered V8 lump weighs the open wheeled chassis down for a rusty patina’d low-rider. This tiger will roar with that motor opened up. 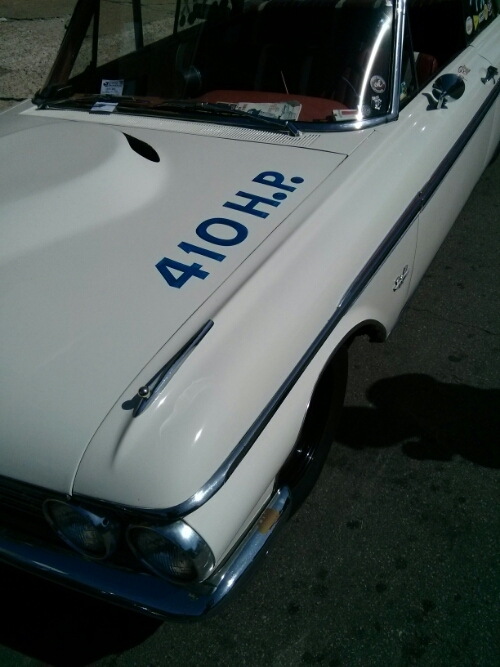 Big engined Ford Galaxie 500 came rumbling in: all parted ways to let this great white through. 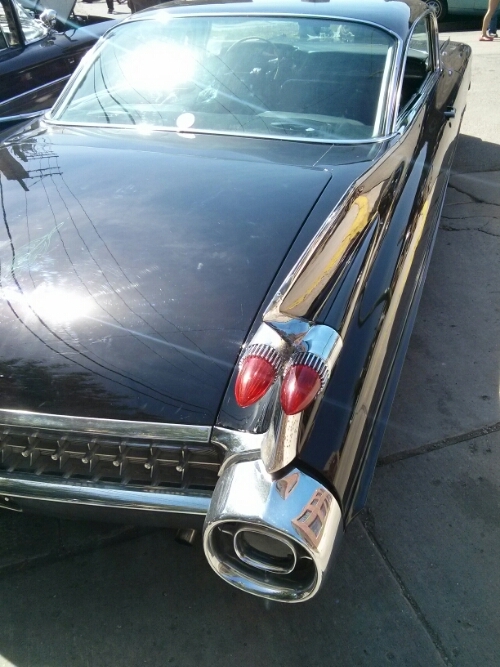 Cadillac 1959: fins that stretch for miles, parking requires two zip codes, its rocket age origins expressed in rear tail light nozzles.The trunk is the area of a small sovereign state. This thing just goes on and on and on…. 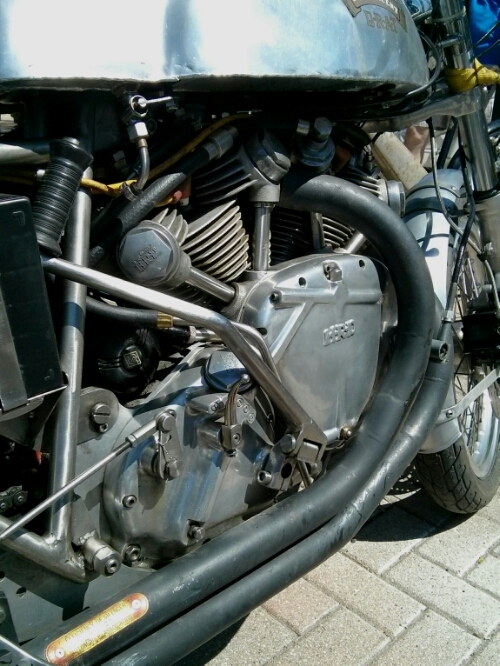 One of my favorite aspects of motorcycling is looking at the pure lines of the chassis, engine, wheels, tank, seat and other components that make it go and stop. Just look at this Parilla: its tight form creates a swallow-like appearance of swiftness. 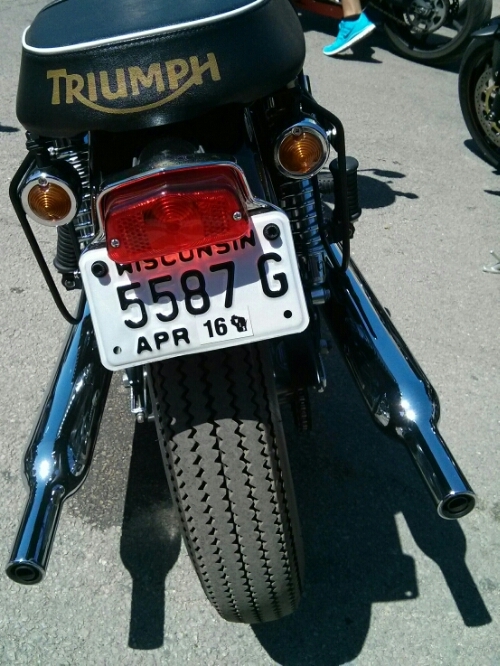 The arched rear sub frame echoed on the tanks pinstripe. The little motor resting perfectly in its cradle. Even the ebony bum-stop perch reflects the Matt black exhaust pipe. Symmetry in motion. 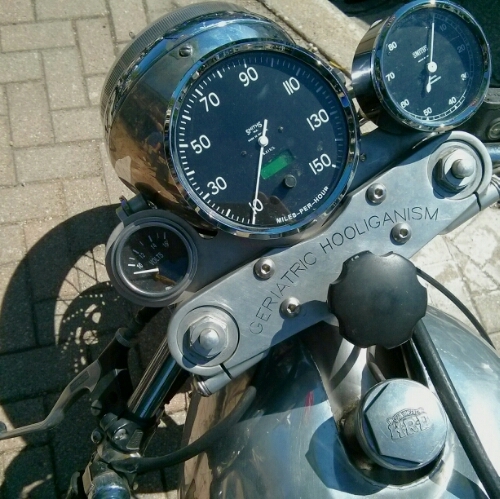 Honda clocks: coordinated information. 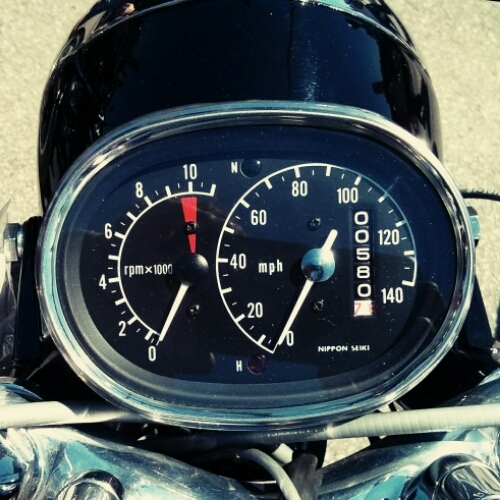 Instead of two separate ‘meters a single one with optimistic speedo stretched over a vertical odometer. Beside it the tach repeats a sweep of revs alongside its neighboring needle. Indian Head: a Chiefs front fender with starkly contrasting whitewall sides and black rim adorned with the backlit stern featured ornament. 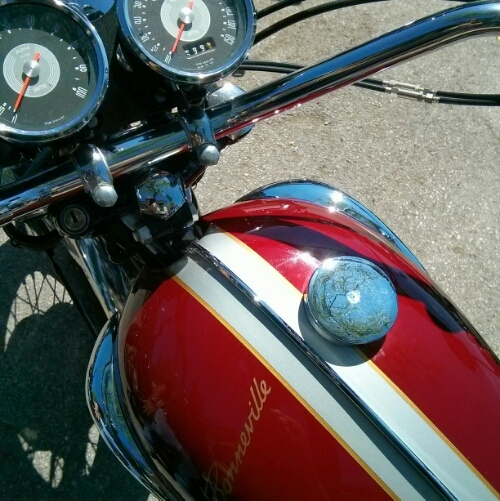 The other Colonial iron, here a sweetly pinstriped tank surrounds the clocks firebird-like. 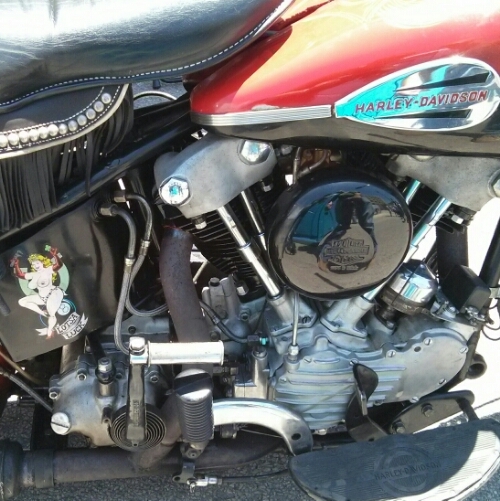 Die gripped gear lever hints at this moto’s age. 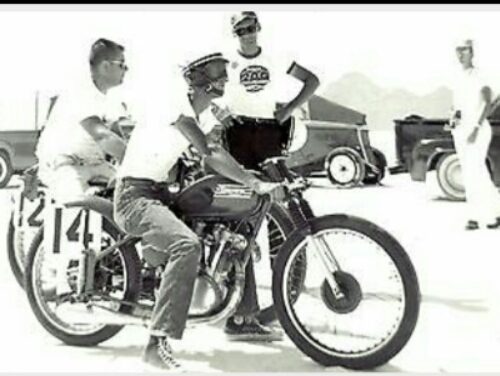 A late 30’s Knucklehead. Modern tin: the polished alloy big racetank is always a thing to admire. 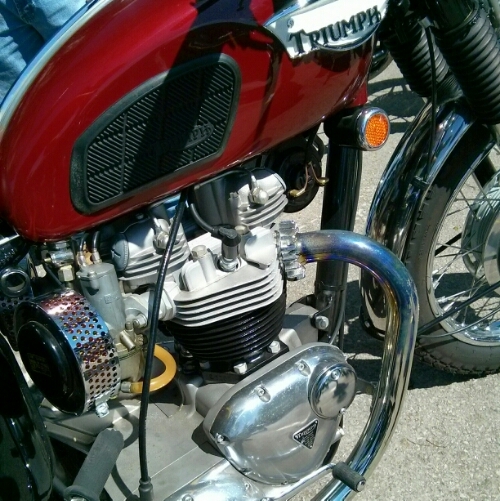 Especially when it sits securely atop a stout twin engine of Triumph fame. 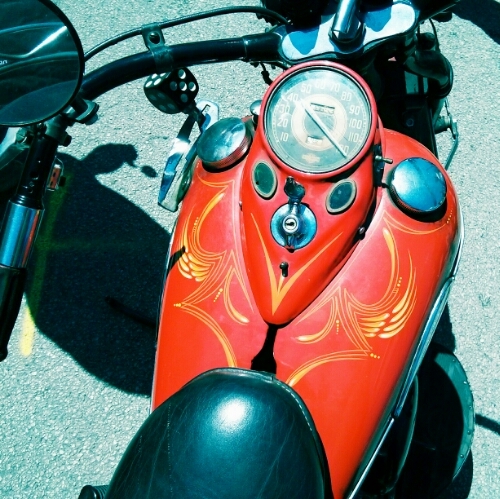 The brown leather seat cover adds the custom touch. 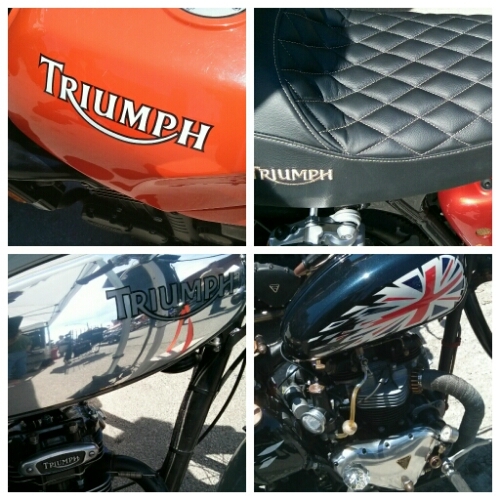 Of course Triumph was represented in the majority at the show. I looked at a few examples of how the brand was marked. The traditional name badge as well as the logo is a common touch; sometimes a Union Flag harks the country of origin of these Machines. I particularly like the embroidered name on the seat. The cross stitched padding in nifty too!